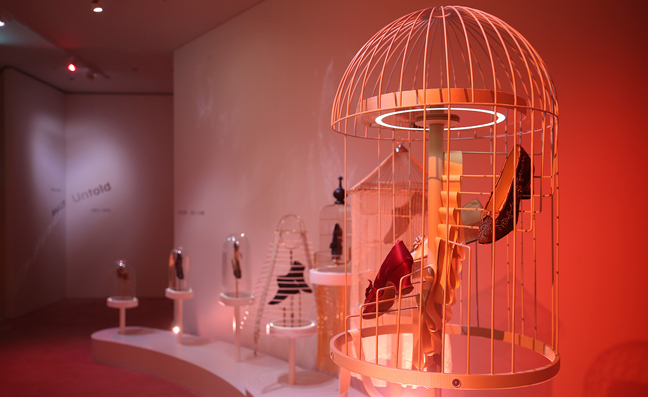 In celebration of the opening of Bally’s new David Chipperfield-designed Tokyu Plaza store, the Swiss house has chosen a selection of shoes from its archive to star in a new travelling exhibition, ‘Bally Untold, Part One: 1851–1951’. 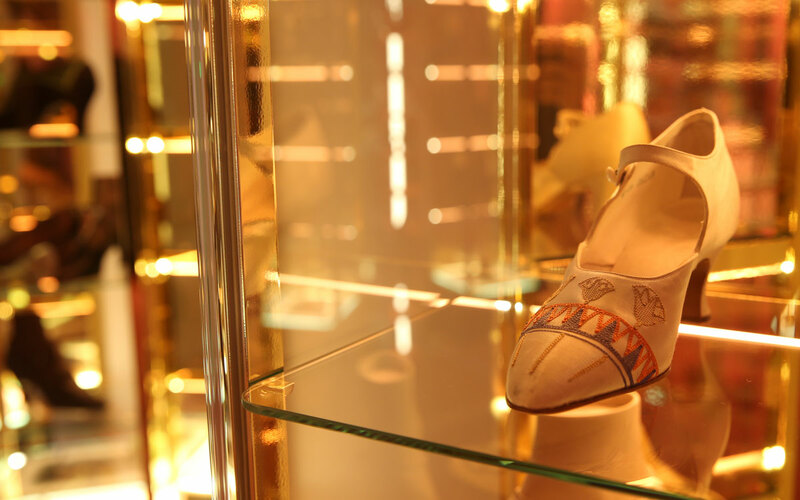 Spanning a hundred years of the house’s shoe-making history, and on view until 8 May in Tokyo, the exhibition traces major design movements in its heels, from the Belle Époque to the art nouveau and art deco periods. Divided into five themed spaces – the first, ‘Cocoon’, dating from 1851–1900; ‘Bloom 1900–1920’; ‘Freedom 1920–1930’; ‘Decadence 1930–1940’; and ‘Defiance 1940–1951’ – the exhibition also explores changing materials over the decades, from exotic skins, silk and leather in the pre-war period, to cork, rope and wood during the war, through to new plastics in the later mid-century. The Bloom room represents the Belle Époque. At the turn of the century, fashion demanded an elegant figure and there was a pronounced taste for corseted curves adorned with layers of lace and ribbons – much like the style of Art Nouveau, which was then at its height. In this section of the exhibition, Bally showcases an array of matt and shiny, black and white, and brocaded silks with metallic threads – delicate designs with bold, graphic qualities. 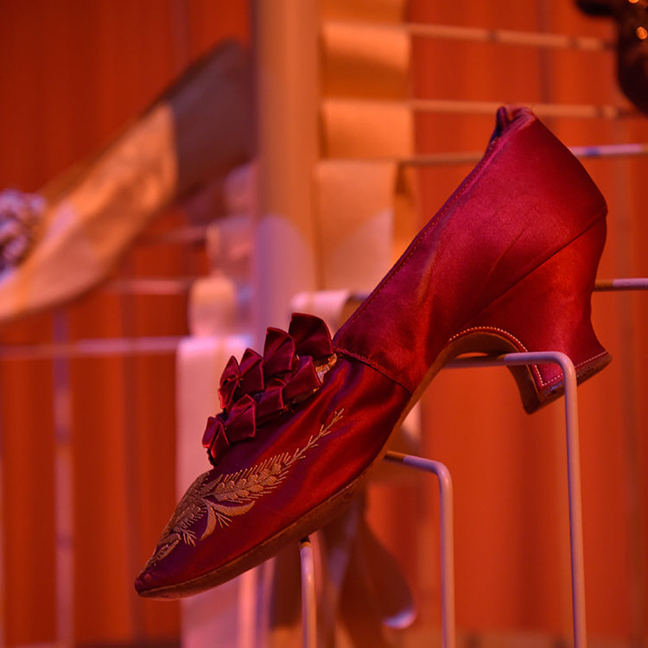 During this era, its shoes featured cut-outs that exposed the insteps and revealed the ankles, revealing skin – albeit discreetly – for the first time. The Freedom room focuses on the Roaring Twenties, when irreverence ruled the day and the flapper was the role model of an entire generation. The generation’s new heroine first appeared in French author Victor Margueritte’s novel La Garçonne (The Bachelor Girl). Her tunic dress – short, straight-cut and worn without a corset – allowed women free movement for the first time. 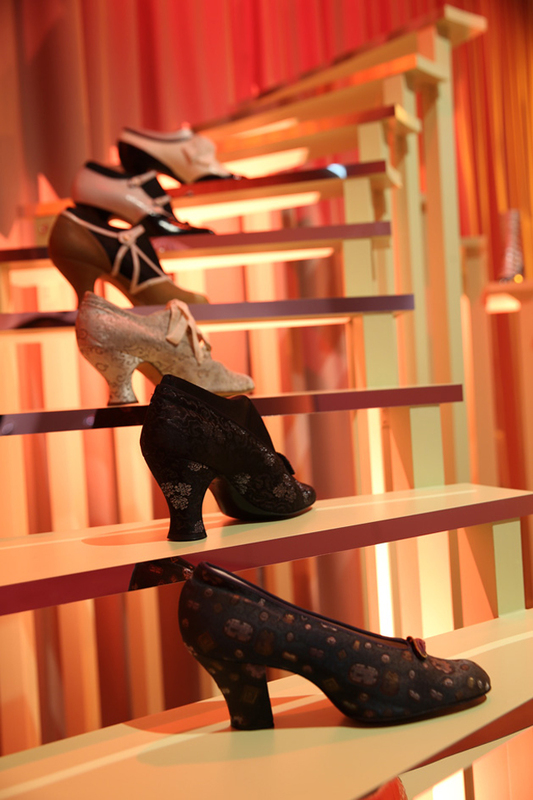 Shoes, too, had an important role to play – the new fashion was to expose as much of the leg as possible and Bally capitalised on the mood of emancipation. The creativity of the dazzling fabrics, intricate embroidery and lively patterns it employed surprise and delight in equal measure. The Decadence room represents the 1930s and the return to glamour. Fashion‘s message was one of femininity, with the re-accentuation of curves, and of sensuality, with a renewed emphasis on the waist, thanks to wide-shouldered dresses cut on the bias. Shoes followed this trend: sandals with single or multiple straps that snaked up around bare ankles, each pair more innovative and revelatory than the next, and towering heels that enhanced the proportions of the silhouette. For daywear, Bally used exotic skins; for evening, it excelled in daring color combinations: satin and brocaded silks in strong pinks and greens, heavenly blues and deep blacks are juxtaposed with glistening silver and gold that accentuates the feet and provides the perfect finishing touch. The room called Defiance is the finale of the exhibition’s journey. Between 1940 and 1945, the traditional image of women being at the mercy of changing fashions shifted towards one of independence and resourcefulness. Due to the shortage of leather, shoes were manufactured with great ingenuity and imagination from alternative materials such as wood, cork and rope. Undeterred, Bally’s designs during this period demonstrated great innovation and creativity. For daywear, reds, blues and whites characterised shoes with varying platform-heel heights, while, for evening, a rich palette of blacks emphasised a chic line of heeled booties and evening sandals alike.In the years following World War II, when the right to elegance was restored, haute couture resumed its splendour and entered a golden age. Synonymous with expert craftsmanship, Bally continues to produce creations with a strong sense of both functionality and modernity. Since its beginnings back in 1851, it has remained faithful to its founder’s values of excellence and innovation, and been keenly attuned to the needs and desires of contemporary society. Bally Untold I encapsulates that vision.